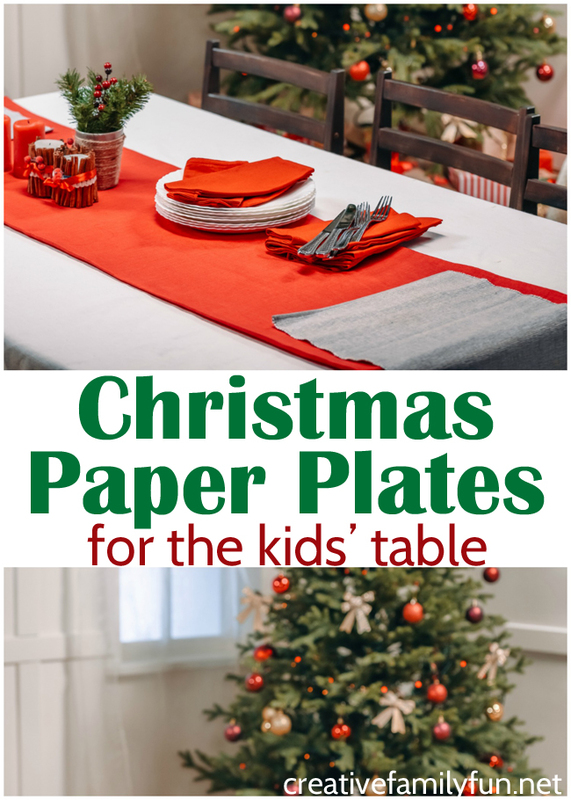 Whether you don’t have enough tableware for all your Christmas guests or are looking for something that won’t break for your younger guests, you may want to turn to Christmas paper plates for your holiday dinner. I know, I know… that seems just too casual. 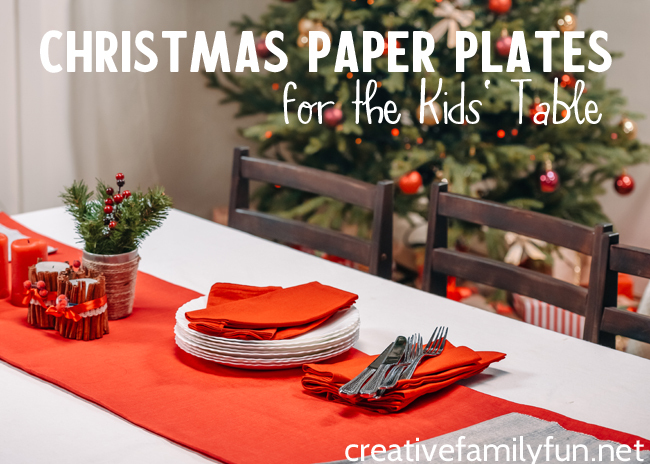 Check out all these fun choices of Christmas paper plates for the kids’ table. They’re fun, festive, elegant, and all are kid-friendly. Let’s set our table with style! The kids will love this set of fun Gingerbread cookies disposable dinnerware. Or, you can choose this festive red and white snowflake dinnerware set. Santa is a great theme for the kids table, so these blue Santa paper plates and napkins would be a fun choice. Also, these Santa belly paper plates are another fun Santa Claus choice. These Christmas lights paper plates will look great on any table. If you’re looking for something a little bit elegant, but still fun for kids, try these gold dot plates and tableware. Kids will absolutely love these fun peppermint paper plates that look just like fun Christmas candy. Or, you can get some paper plates based on a fun Christmas movie, like these fun Grinch paper plates. 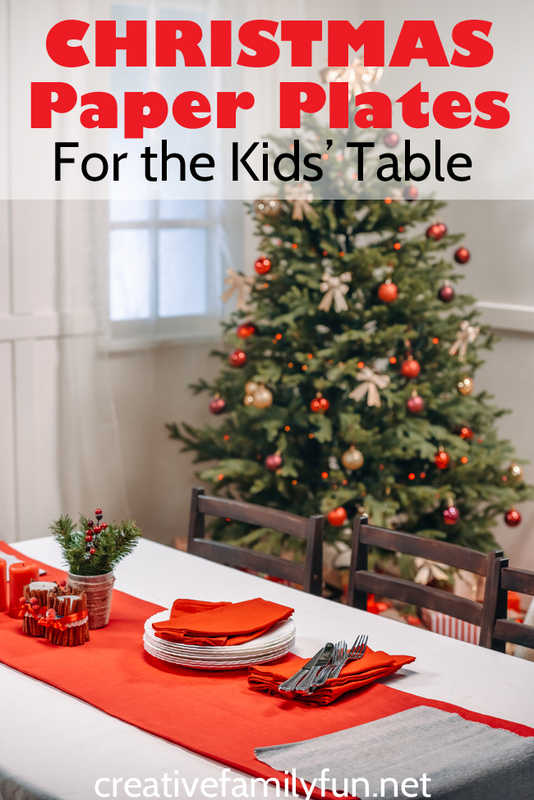 These red-rimmed Christmas tree plates are a classic choice and would look good on both the kids’ table and the adults’ table. Or you could choose these modern Christmas tree plates that are just a bit whimsical. They even come with fun gold knives, spoons, and forks. These buffalo plaid tree plates will make you feel like you’re having Christmas dinner at the cabin. Traditional is also good and these pretty Christmas tree paper plates will look great on any table. Which of these fun Christmas paper plates are you going to use this year? Christmas will be here before you know it, in fact, it’s almost a month away! My kids love getting into the kitchen around the holidays and helping bake or cook meals. Getting your kids involved in cooking while their young can teach them valuable kitchen skills, and even teach them to cook on their own in the future. 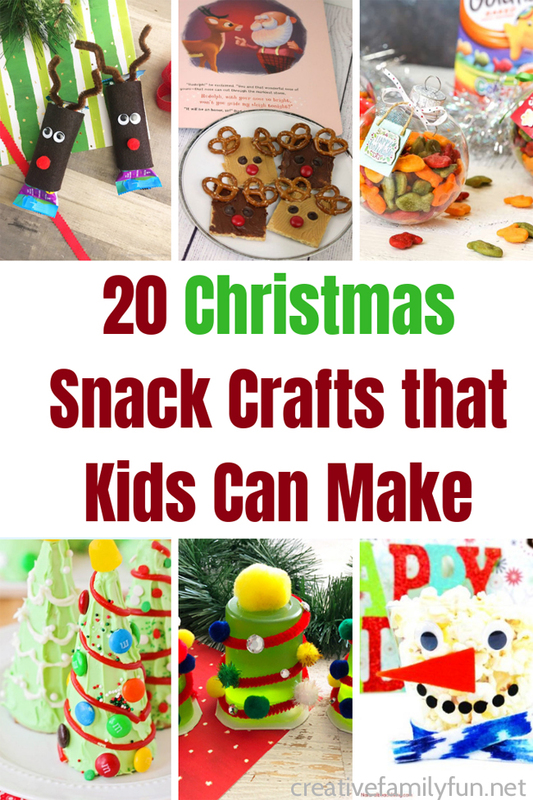 Making snack crafts is a fun way to get the little ones interested in cooking, and that’s why I put together 20 Christmas snack crafts that your kids can make. While they need a little parental supervision, most of these recipes can be made without you. 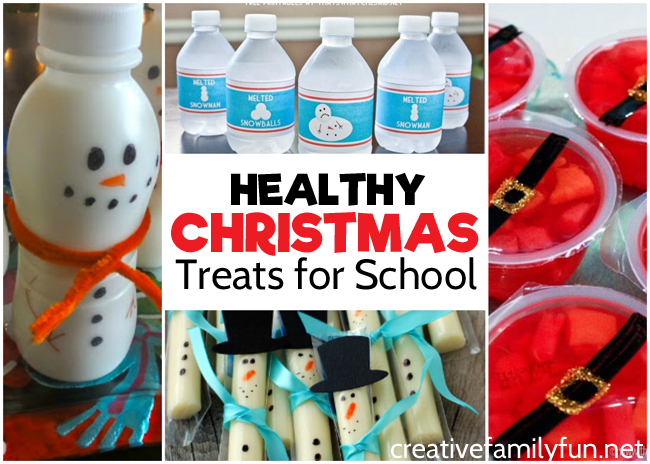 Turn serving cups into a cute Snowman Snack Craft from Natural Beach Living to make any Christmas party more fun. This sweet and salty Christmas Popcorn from Mom Foodie would be great for a Christmas movie night. Take an Oreo and turn into a cute Christmas Reindeer snack from Childhood 101. A simple Snack Filled Ornament from Busy Creating Memories would make a great party favor or a simple gift for friends. This Gingerbread Christmas Tree from Busy Mommy Media is simple enough for even your littlest kids to make. 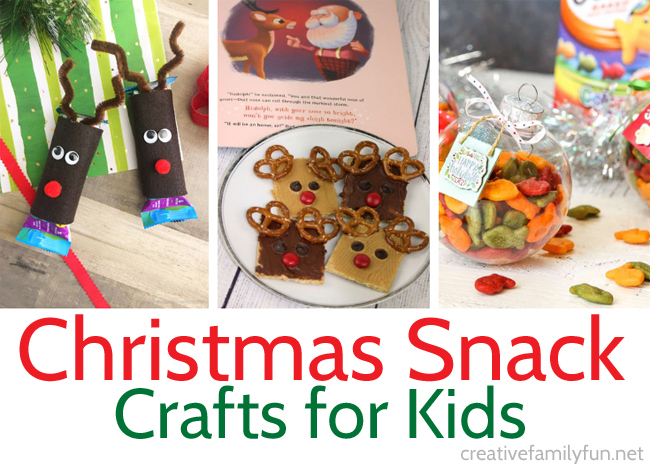 Rudolph Christmas Snacks from Rainy Day Mum would make a fun after school snack. Christmas Strawberries from Wondermom Wannabe turn simple strawberries into sparkly Christmas lights. Fun! 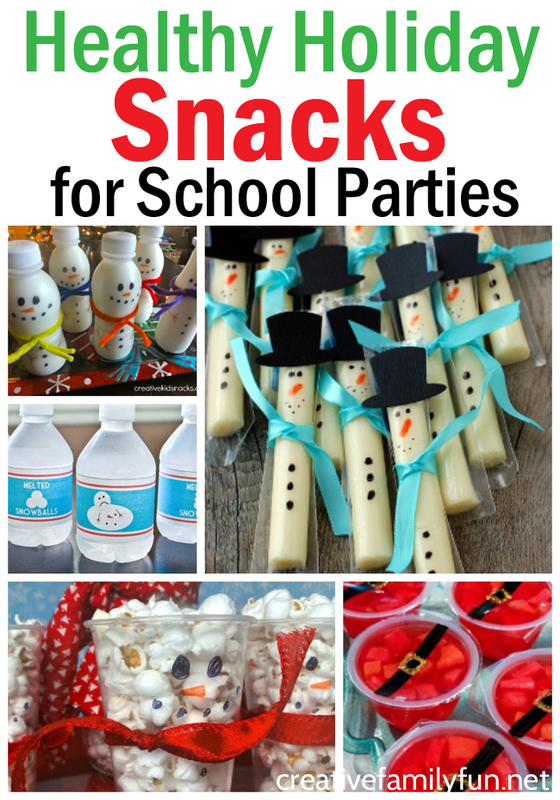 Turn pretzel sticks into fun Rudolph Treats likes these from Masshole Mommy. You can find similar candy eyes here. A Rainbow Cookie Gift Jar from Red Ted Art makes a fun kid-made Christmas gifts. And, they’re also fun for the kids to make! These fruit Christmas Kabobs from Suburban Simplicity are a fun and healthy snack. Fudge can actually be a very easy Christmas treat to make and this Easy Christmas Fudge from Tweenhood is the perfect recipe for your kids to try themselves. I’ve never met a kid that hasn’t had fun turning an ice cream cone into a fun Waffle Cone Christmas Trees like these from Somewhat Simple. Make a store-bought snack special by turning it into a Reindeer Granola Bar with this package decoration idea from A Night Owl Blog. 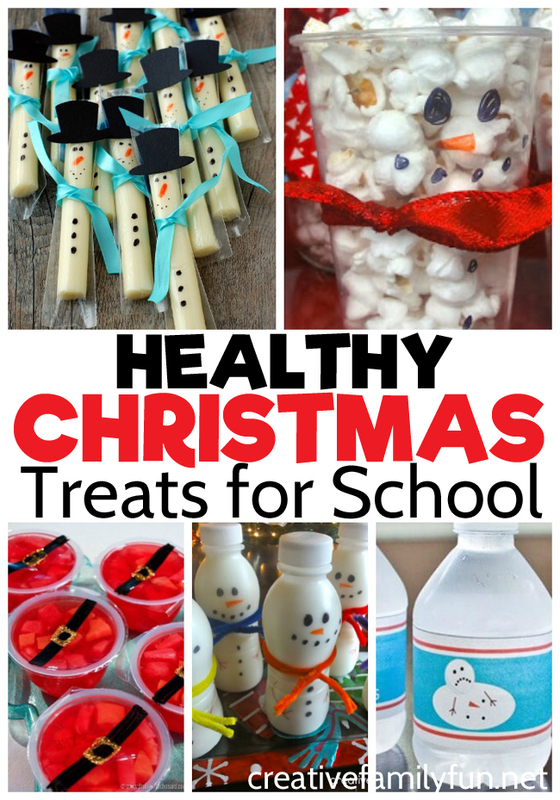 Use celery sticks to make this Healthy Christmas Tree Snack from Fantastic Fun and Learning. Turn store-bought Jello cups into a fun Christmas Tree Snack from Craft Create Cook. Build a Santa Candy Sleigh from Red Ted Art out of your Christmas candy. This would also make a fun gift for your friends! These Wreath Chocolate Covered Oreos from Heartbeats Soul Stains would make a fun addition to the cookie tray. Make these Celery Reindeer Snacks from Wondermom Wannabe for fun and healthy after school snack. Kids will love to make their own Christmas candy when they make these Chocolate Rudolph Bites from Chocolate and Wine, I’ll Be Fine. 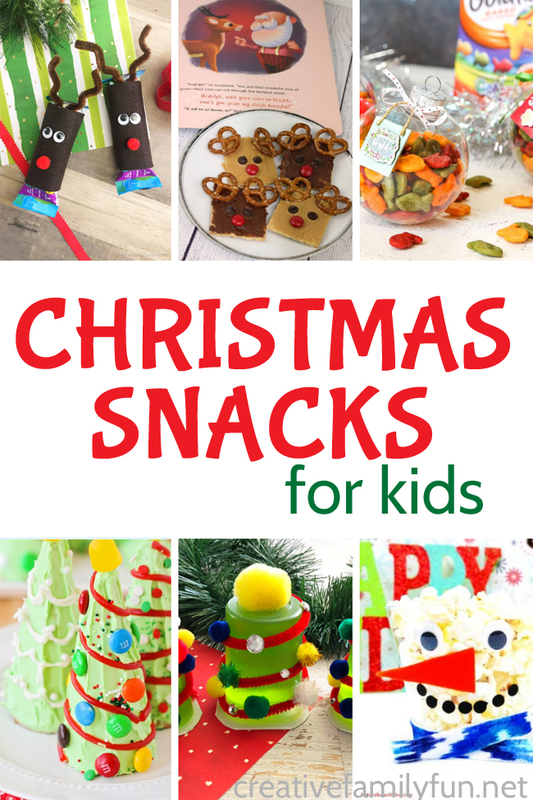 Which of these fun Christmas snack crafts are you going to make with your kids? You can make your Christmas snack crafts festive with some fun holiday-themed dishes and serving ware. Grab some cute paper plates for serving or display your fun creations on a pretty Christmas platter. Here are some of our favorite choices. I just love a crisp, juicy apple. Do you? It’s September, and apples are at that best. 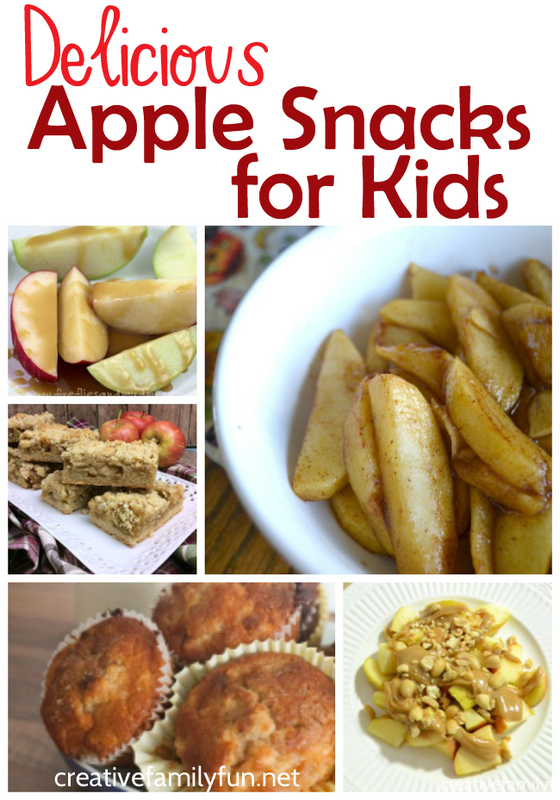 So, grab a few and eat them, but be sure to save a couple (or more) for one of these delicious apple snacks for kids. 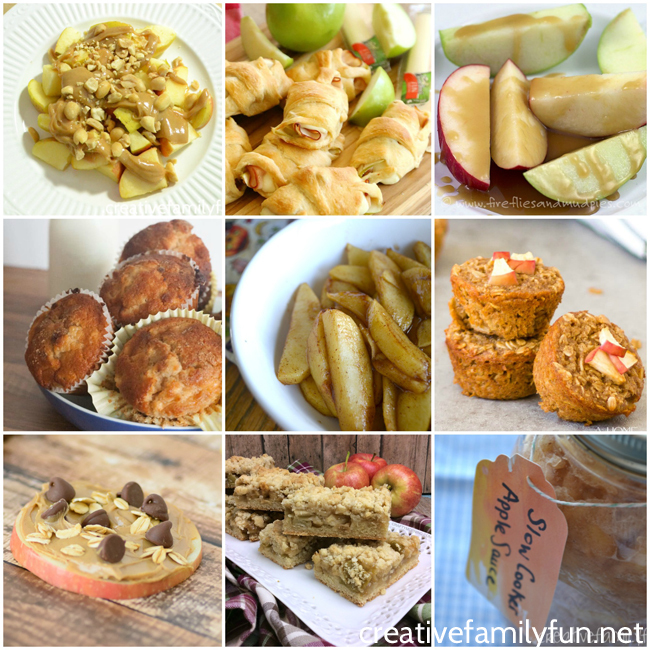 Cinnamon pairs deliciously with apples in this simple Apple and Cinnamon Breakfast Muffin Recipe from Rainy Day Mum. These Apple Crumble Bars from Crafty Morning are a delicious treat. These Baked Apple Pie Oatmeal Muffins from Kenarry have all the flavor of apple pie in a healthier treat. This Apple and Cinnamon Loaf Cake from Rainy Day Mum is a great recipe to have the kids help with. It’s a favorite at our house! Make your own granola bars with this Oatmeal and Apple Granola Bar recipe from Super Healthy Kids. Enjoy some Iced Apple Butterscotch Oatmeal Cookies from Sugar Dish Me. 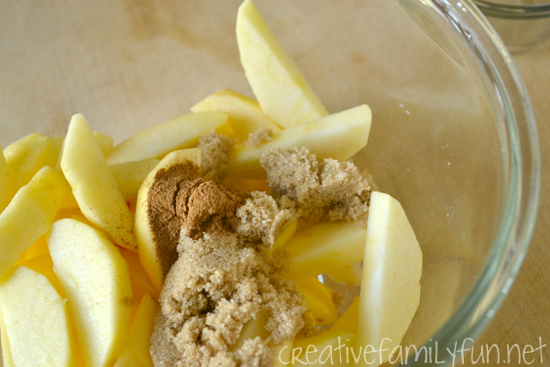 Kids love applesauce and did you know how easy it is to make your own? Try our simple Slow Cooker Applesauce. It’s so easy. One of our favorite ways to eat apples is this simple recipe: Baked Apples. It tasted just like the filling of apple pie, without all the sugar. Our Peanut Butter Honey Apples are crispy, delicious, and so much fun to eat. Did you know that even apple skins can be delicious? 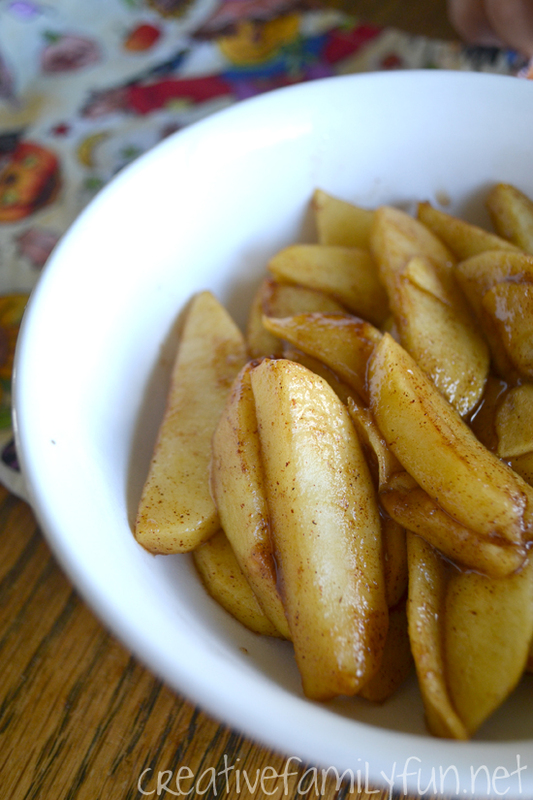 Try these Camelized Apple Skin Crisps from Kitchen Counter Chronicles. Add some topping to your apples to make these yummy Almost-Good-For-You Apple Cookies from Almost Supermom. Cover your apples with this yummy Salted Caramel Apple Dip from Fireflies and Mud Pies. Make your apple snack a little more hearty when you make these Turkey, Apple, and Cheese Crescent Rolls from Mom Endeavors. This Crunchy Apple Peanut Butter Wrap from Finding Zest is so simple the kids can make it themselves. 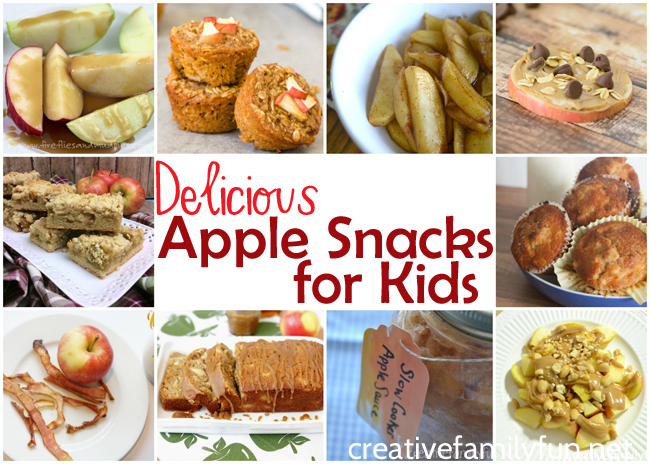 Which of these yummy apple snacks for kids do you want to make? After school snack time is a very important part of our day. My girls and I reconnect, chat about our day, and sometimes just settle in with a good book and some yummy food. One of our favorite snacks in the fall is baked apples. We’ve always got a bowl full of apples and tend to indulge in them a lot during September and October. This post contains Amazon Affiliate and other affiliate links. Please see my disclosure for more information. 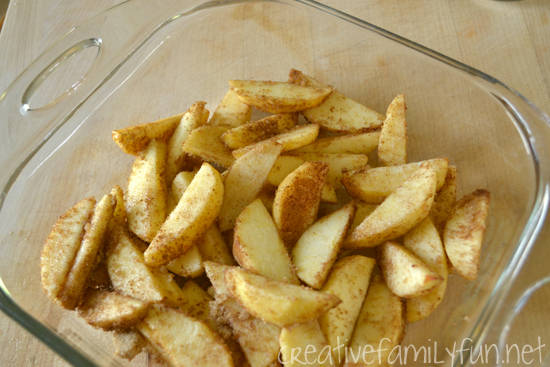 This recipe for baked apples is super simple to make and requires only three ingredients. And, it’s a fun recipe for the kids to help bake. 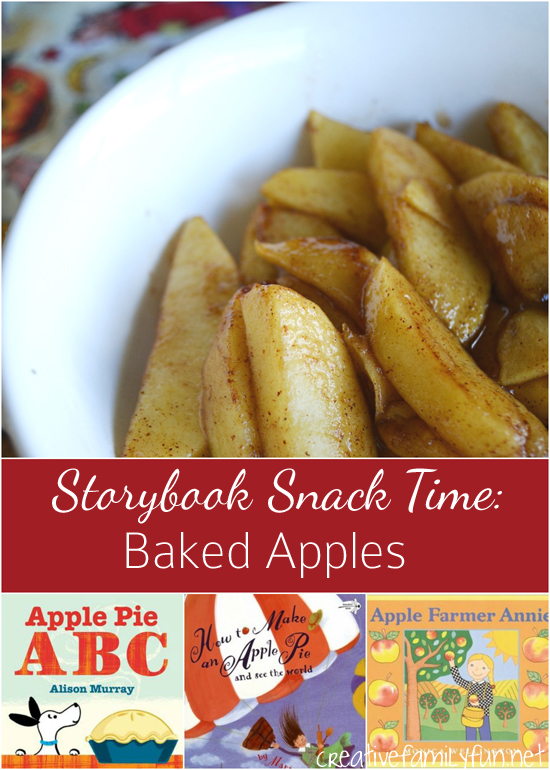 Combine this snack with a good book about apples and you’ve got a fun way to reconnect after school or any time. This recipe makes 2 snack-sized portions. It’s very easy to double (or triple) to make as much as you need. Slice and peel all of your apples. I usually slice them the same as if I were serving them raw. If you have one of those nifty apple corer and slicer gadgets, use that. Your apples will be the perfect size. 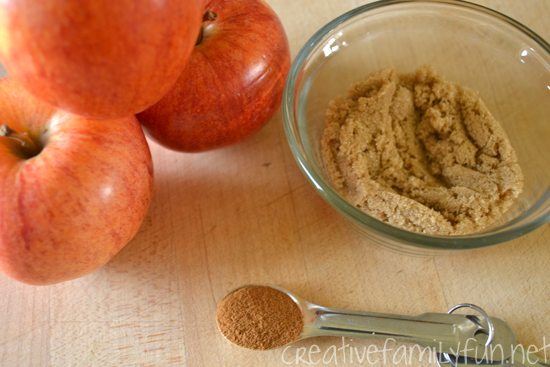 Throw your apples in a bowl with your brown sugar and cinnamon. 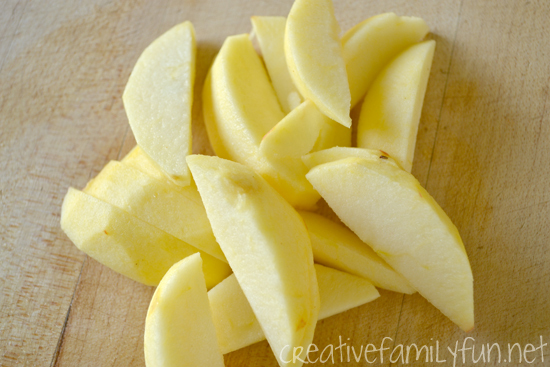 Mix them up until your apples slices are evenly coated. *Note: we love the taste of cinnamon, so feel free to adjust the amount of cinnamon to your tastes. After your apples are coated, put them in an 8×8 square baking pan. Put them in a 375 degree oven for 10 minutes. After 10 minutes, your apples are starting to get juicy and your house will smell like apple pie. Yummy! Stir the apples and pop them in the oven for 10 minutes more. Now it’s time to eat! For a special treat, we love to put a little whipped cream on top. While you’re eating those apples, indulge in a good story. There are many great books about apples, but these are some of our favorites. Slice and peel your apples. Combine all ingredients in a bowl. Stir to coat the apple slices evenly. Put in an 8×8 baking dish and bake in a 375 degree oven for 10 minutes. Stir. Bake for 10 minutes more. Serve immediately.